Deon Moore has been a clinical instructor for 11 years and really enjoys teaching medical imaging students who are truly interested in the field of radiology. Deon graduated from Baylor University Medical Center in Dallas, TX and has worked in diagnostic radiology for 26 years. 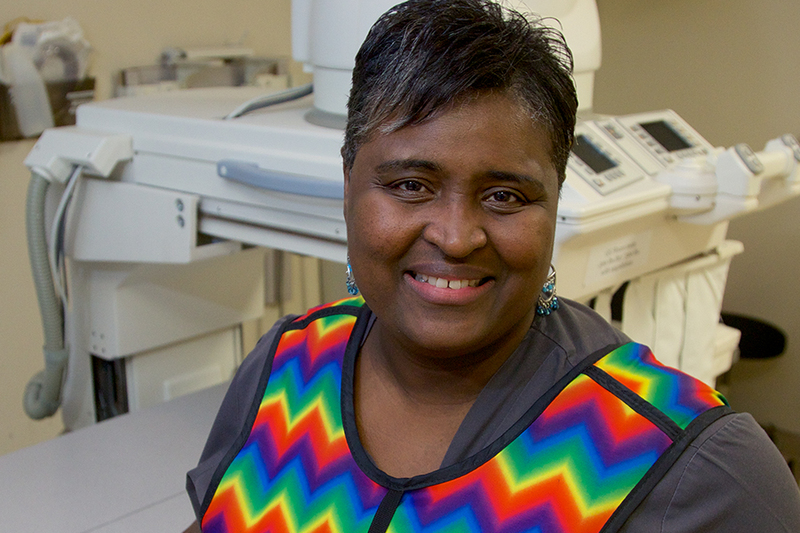 Deon recently celebrated her 14th anniversary as an employee at EUHM. Her teaching technique involves training students in the correct methods of X-ray production while encouraging them to build a rapport with the radiologists. Deon explains, “I enjoy teaching students the correct way and not to be intimidated by the procedure or the radiologists. The radiologists at EUHM enjoy teaching as well; most are professors at the SOM.” Deon also enforces the importance of anatomy to the students, as they will use it from modality to modality. Deon is a level three technologist at EUHM. She is responsible for stepping in when the supervisor is either absent or away from the main radiology area. Deon is also responsible for training new hires and controlling the flow of in-patients and out-patients. She works mostly in fluoroscopic procedures and assists the radiologists and residents in multiple exams. Deon knew early on that she wanted to be in the medical field. She began following her mother’s footsteps by pursuing a nursing degree after high school, but changed her focus to radiology. Deon said, “There is nothing else I wanted to do, I always wanted to be in the medical field.” Deon enjoys communicating with others the qualities that are a must to be successful in healthcare. She also loves traveling, baking and, of course, shopping. The Medical Imaging Program wishes to thank Deon for her service to the program and her dedication to our students.